Workers have been fed up with unfair and unsafe working conditions for decades. Now, with the hope of labour law reforms and minimum wage increases proposed in Bill 148, many in our communities are breathing sighs of relief. However, organizers at the Workers’ Action Centre and in the Fight for $15 and Fairness are reminding everyone that Bill 148 is not yet a done deal. Precarious workers and our allies must continue to speak up and take action to get the fair workplaces we deserve. Just last month, restaurant workers made media headlines as they spoke out about poor working conditions and labour law violations in several well-known eateries. Workers at Poutini’s, a Toronto poutine restaurant, walked off the job for various reasons, including unfair scheduling, wages paid late, and unsafe working conditions. A Metro News article explains that Bill 148 could begin to solve the typical problems that restaurant workers face. A few days later, workers at the popular Chef Susur Lee’s restaurants took to social media to call out their employer for violations. According to a CBC News article, Susur Lee’s eateries used the illegal practice of deducting money from workers’ wages for common mistakes such as “Spilling a drink, sending the wrong drink to a table or punching in an incorrect order with the kitchen.” The restaurants quickly stopped this practice when workers began speaking out, which goes to show there is power in workers speaking up and standing up for their rights. Restaurant and hospitality workers also face unpaid wages, unfair tip calculations, and no overtime or public holiday pay. You might be a restaurant worker or have family and friends facing these issues at work. It’s hard to speak up against violations when it can threaten your ability to pay the rent. While we push for a stronger Bill 148 to be made law, you can still take steps to protect yourself by knowing your current rights at work. You should get overtime pay after working 44 hours in a week. Even with signed consent from you, the worker, your boss cannot make a deduction from your wages for a mistake you have made, for a cash shortage in the till, or for the customer’s failure to pay. Check out these links for more information: Tips and other gratuities and Right to refuse or to stop work where health and safety are in danger. Call the Workers’ Action Centre hotline at 416-531-0778 if you have any questions or need some support. Today, the Ontario legislature reconvenes and we expect Bill 148 to soon continue along the process of officially becoming law. Bill 148 will bring changes to lessen unfair scheduling such as the ability to request a schedule or location change without being fired, compensation for 3 hours of work if your shift is cancelled within 48 hours, and the right to refuse a shift if you have been given less than 96 hours notice. The proposed laws also include 2 paid personal emergency leave days. It’s just common sense that workers need paid sick days, especially in the restaurant industry where public health conditions should be a top priority! 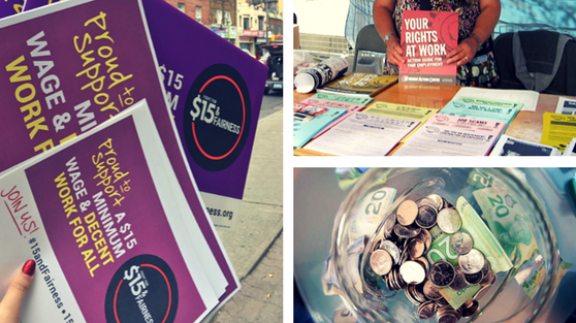 Get involved in the Fight for $15 and Fairness campaign to make sure this new legislation passes. Visit 15andFairness.org and take action. Email Premiere Wynne about the urgent need to strengthen and pass Bill 148. Let’s all speak up and make a change!